Les Allamby, Chief Commissioner of the Northern Ireland Human Rights Commission, argues that urgent reform is needed to help those who are suffering economic hardship. 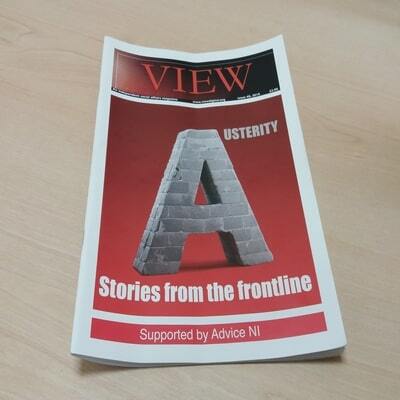 This article is taken from the social affairs magazine VIEW, with this particular edition focusing on austerity. You can access it here. Living in poverty is like ‘swimming against the tide where the tide never turns.’ This is a neat summary of the impact of recent tax and social security reforms. The Equality and Human Rights Commission in Britain recently published an analysis of the cumulative impact of all tax and social security policy changes made between May 2010 and January 2018 and due to be implemented, up to the end of the financial year 2021/2022. The findings make familiar and depressing reading. There are large adverse impacts for households with disabled people, particularly so for individuals with more severe disabilities as well as for lone parents on low incomes. A household with at least one disabled adult and a disabled child has lost over £6,500 a year while a lone parent in similar circumstances has fared even worse losing £10,000 a year. The changes have also led to significant increases in the number of children living below a minimum acceptable standard of living. These findings are replicated in research looking at what it means to live in practice on a low income. The Joseph Rowntree Foundation has presented annual research on the income level that working age adults and pensioners say is needed for an acceptable standard of living. In essence, this is a measure of the income needed to live at a standard we take for granted to pay bills, heat our homes, feed ourselves and engage in modest civic and leisure activities. The 2018 report found that social security benefit levels have not kept up with the costs of living assessed to meet the minimum income standard. This has affected both households receiving in-work benefits and tax credits and those getting no income from work. The report recommends ending the freeze on working age social security benefits and increasing the Universal Credit work allowances. Closer to home, JRF published an analysis of poverty in Northern Ireland in 2018 revealing that we have 370,000 people living in poverty. This figure encompasses 220,000 working age adults, 110,000 children and 40,000 pensioners. An important finding is that while the risk of poverty is much lower for working age households where one or more person is in work over one in eight people in such households still live in poverty. The government’s mantra that work is the route out of poverty no longer holds true with gains from the rise in national minimum wage being outstripped by cuts to social security. This is important in Northern Ireland where the mitigations package to ameliorate earlier changes to social security ends in 2019/2020. Elsewhere there are shards of light. The Scottish Government has introduced its own mitigation measures alongside the concept of a human rights based approach to delivering social security benefits underpinned by the principles of dignity and respect. Moreover, a number of the significant changes are being challenged in the courts on human rights grounds including the further reduction in the ‘benefit cap’ and the two-child rule introduced to Child Tax Credit and Universal Credit. The results of such challenges have been mixed, yet there have been notable successes including the DWP’s decision not to challenge a High Court decision that regulations to restrict entitlement to the Personal Independence Payment mobility component for people suffering psychological distress was ‘blatantly discriminatory’ and a breach of the European Convention on Human Rights. The Commission is interested in exploring human rights legal challenges and operates a weekly free legal advice clinic by appointment. The International Covenant of Economic, Social and Cultural Rights provides that everyone should have an adequate standard of living. This is a goal to be achieved progressively with no room for backsliding. Philip Alston the UN Special Rapporteur for Extreme Poverty has written of the need to embrace tax justice – both more progressive tax systems and corporations paying their taxes as the key to tackling economic and social rights injustices. As a society, we need to highlight what can be done. That will mean creating a public and political will for meaningful progressive tax and social security reform. We owe nothing less to the 370,000 people living in poverty today to ensure the tide can turn.